Rationalist Judaism: To The Batcage! Combined in this advertisement are two abuses - that of rabbinic authority, and that of fundraising for charity. One of the verses in the Torah most abused in the charedi world is "V'asisa k'chal asher yorucha." The general view amongst the Rishonim is that this is a directive to follow the Beis Din HaGadol, when it issues its rulings according to protocol. A minority view, presented by the Sefer HaChinnuch (very much not a major halachic authority), extends this to the Torah leaders of every generation - though the Minchas Chinnuch notes that this is only when they, too, are following the protocols of the Beis Din HaGadol. The Charedi world, however, presents this passuk as unequivocally demanding that everyone follows "Daas Torah" i.e. the pronouncements, issued without any protocol, of a few rabbonim named as Gedolei HaDor. In this ad we see how the charity manipulates potential donors using the popular charedi abuse of "V'asisa k'chal asher yorucha." Rav Ovadiah Yosef is pictured here writing a check to the charity. Fine. He writes about the importance of charity. Fine. But by headlining this with "v'asisa k'chal asher yorucha," the charity transforms this into a specific mitzvah for people to give to this particular charity! And it states that only by giving to this charity, does one receive the reward that he promises! In case people accuse me of reading too much into it, and claim that the ad is simply asking people to give charity, I say as follows: If that is all the ad is doing, let them just talk about the value of charity, without having to invoke the Gedolim. Apparently, the mitzvah of tzedakah alone is not sufficient basis to ask for charity. After all, people might give to the wrong charity! But under the allegedly Biblical mandate to follow what the Gedolim say and/or do, one is now obligated to give to this particular charity! And if one gives to a different charity, such as the phenomenal Lemaan Achai, one does not merit the promised blessings! On a broader level, this ad highlights a general problem: that Torah and Judaism is being transformed such that everything is about the Gedolim. But let's discuss that further on another occasion. 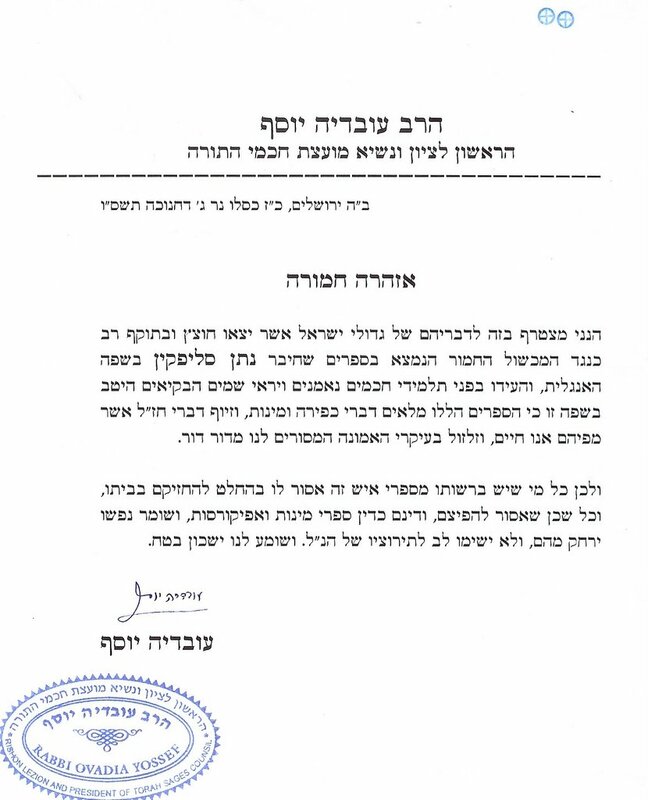 Rabbi Slifkin wrote: "(A similar ad appeared a while back, claiming that one must follow Gadol X who insisted on giving to the kupa tzedakah of Bnei Brak - but of course he did this because it was his local charity - which does not apply to people outside of Bnei Brak!)" I was told by a mentor of mine (we both live in Jerusalem) that Kupat Ha'Ir Bnei Brak distributes charity money to needy Yerushalmi families as well (if that is relevant here). No, it doesn't mitigate their abuse of Gadol X (except that they might additionally be guilty of false advertising). While I agree with the substance of the post I find it the lowest point that this blog has sunk to so far. 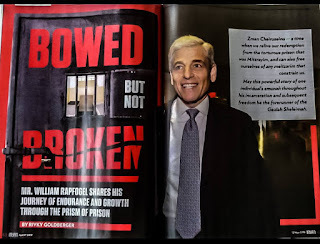 It's shocking to me that you would line your cages with photos of rabbonim and verses from the Torah! I have a lot of harsh words to say, but will hold them back. LOL, Carol, don't ever come to Israel. These newspapers are rotting in the streets, and most go straight to the garbage. Better that they should be used for something constructive! Another point: I just recalled that in Kitzur Shulchan Aruch (134:14) it says not to write psukim on a gourd or the like as a Sukkah ornament, because the gourd will get thrown out afterwards, and it's disrepectful to the words of the possuk. I think it's proper to check the newspaper that there aren't any psukim or other divrei Torah before using it for the batcage. What's so special about photos of anyone that you include that in your comment? It reminds me of the story of how a certain Rav was asked if it is muttar to take the Yated into the bathroom. He replied: The question is, is it muttar to take the Yated out of the bathroom? There have been some p'sakim about such papers in recent years, as the volume of parsha sheets is overwhelming genizot- burying them doesn't come free, you know. Many years ago, my rav in New York, who publishes one of the oldest parsha sheets, got the p'sak that (as long as Hashem's name isn't on it) you could put it into the trash so long as it was in a separate bag so it wouldn't get dirty from "real" trash. More recently, with the advent of recycling bins, there's been a p'sak that you can just stick them in, as they won't get dirty in there. Again, this is true even of pesukim so long as Hashem's name isn't on them (which is never is, except by mistake- there was a recent incident with a billboard for Serugim among others). A batcage seems pretty bad to me, though. But my theory is, it's on the head of the one who prints it. I used to throw those free seforim we got in the mail into recycling based on that theory. "Kupat HaIr" is a trick even in its name: It takes the concept of having to give to *your* kupat hair and takes that as their name. This is aside from their (and others) disgusting advertising. The best part of all this, however, is the check: Do R' Ovadya's checks really say "shlita" on them? Do we now have his bank account number- no, they whited that out. Ah well. R' Ovadia Yosef's usual appearance doesn't look anything like the typical black hat rav, a fact which would probably have some effect on the efficacy of using his image. The blatant attempt to portray R' Ovadia Yosef as one of their own is also quite manipulative. Actually the Torah recommends what you did. After all, in the verse in Devarim about established outhouses in military camps, we are told to have a Yated to cover up that which comes forth from us. I'm with Carol here. Your critique of the ad is spot on, but your treatment of the paper is unacceptable. Since when is the Yated your posek??? This is the first time that I think your bitterness is showing. You know I have been a very staunch supporter of your cause and admire you for having persevered, but I think you are doing that cause no good here. I'm sure that there are differing views on this matter, but Rav Shlomo Zalman Auerbach ruled that such newspapers, which are printed by machine rather than written by hand, do not attain the status of sanctity as long as they are not read by people. Although, it occurs to me now that by noticing this ad when I lined the cage, that may be a problem. In future I shall be careful not to look! Rabbi Slifkin: Re your reply, I am not speaklng about the technical halakhah. I am speaking about basic good taste. The whole idea of celebrity endorsements for tzedakah puts me off. If some fellow comes to me in shul,asking for cash to help with something serious, I`m supposed to say `Sorry Kupat ha`ir got your allotment `? On a heavy morning- I almost said bad morning-we can get seven collectors,this in a minyan of sixteen people . Some of them are from Israel anyway.The world of gay`n noch gelt is competitive enough as it is . One more thing. If it`s such a worthwhile cause,then why are all those testimonials anonymous ? Sorry, I just don't understand why it's poor taste. Everyone uses newspaper to line birdcages; every newspaper in Israel contains some divrei Torah. In any case, they just go straight into the garbage otherwise. The last advertisement we received for Kupat Ha'ir showed a website. NS- "Sorry, I just don't understand why it's poor taste. Everyone uses newspaper to line birdcages; every newspaper in Israel contains some divrei Torah. In any case, they just go straight into the garbage otherwise." Because you dafka had to use the page with the picture of Rabbi Ovadia Yosef? How would you feel if someone who had a picture of yourself, and used it to put under bird droppings? By also stating soo you are blatently disrespecting R' Ovadia Yosef, 1-as a person 2- as a Rabbi and a big Possek of the generation and disrespecting the Torah as well by the disrespect to a sage. - Their are serious Mahlokot and issues within the haredi and actually all of the Jewish world (Including the Dati-Leumi and Modern-Orthodox world as well). But such disrespect is also disresepct to the Torah that the sage represents. R' Ovadia Yosef knows ~50,000 books by heart do you even know 1? One can disagree (with logical proof) with some of his Halahic points, no problem but such disrespect is uncalled for. This post is indeed in poor taste. That is to say, its not anything Charedim wouldnt do or say about someone else, of course, it just means RNS is getting into the gutter with them. On the other hand, perhaps that is exactly what's called for. On balance, I think this post is in poor taste. Re Torah sheets: whether de facto or de jure, everyone throws them into the garbage. Even shuls who dont throw them out biyadayim, leave them for the janitor, and they knowingly allow the janitor to throw them out. All this stuff about putting them into bags, or distinguishing between things that are read and things that are printed - that's all invented ex post facto to rationalize the reality. To address some of the commentors here who apparently didn't read the post carefully, I don't think R' Slifkin is going out of his way to seek out these newspapers and use them for the most degrading purpose he can think of. The fact is that when you own birds, bats, rodents, or anything else you would keep in a cage, you need something to line the cage for hygienic purposes. It happens to be that papers such as Yated are delivered for R' Slifkin, and he has found an excellent use for them--there's nothing malicious going on here. Arie is exactly right. It never once occurred to me not to use newspaper to line the cage (what, I should buy printer paper specially for the purpose? ), and I was very taken aback by the reactions here! Can you please provide the location of the psak from Rav Auerbach? Rabbi, to explain the umbrage that many readers are taking I think you need to look at things from a different perspective. If a dvar torah of yours was printed in a newspaper and you later found out that those papers were being used to clean animal waste (chalilah), would you not find that to be distasteful even if technically within the bounds of halacha? Not in the least. I honestly think that the difference comes down to those who keep such pets, and those who don't! Then I would have to say you might consider the fact that in this situation, batel dai'tcha eitzel kol adam. I think the majority of people would and do find it offensive and a lack of kavod hatorah, though obviously not intended as such. Here`s an idea, Rabbi Slifkin. Why doesn`t somebody write to these various publications,ask them which is best suited to line some cage ? Also,would it make a difference if the animal is kosher or not ? What if it`s a printout of a page ,like from a website,is that easier ?
" Not in the least. I honestly think that the difference comes down to those who keep such pets, and those who don't!" It's funny that despite my being one of the most liberal commenters on your blog it troubles me as well. Then again, it would also trouble me if it were the New Testament, and I suspect that's not the case for your other commenters. I don't comment much and I generally agree with your rationalist approach, but I agree with the commentators that you are stooping to lower levels in your disrespect of Torah and Talmidei Chachamim. It's a shame that you seem oblivious to this. We readers saw a similar thing with your satire of Rav Bleich that even Rabbi Adlerstein commented on. While of course it's true that people use newspapers for bird cages, your whole tone is disrespectful and degrading. Since you have so much valuable writing and thinking to share, why don't you stick to the high road and debate the issues. Leave the sarcasm, satire, and disrespect to others. Even if R'SZA says you can discard a paper with Torah in it, that does not mean you can degrade it. For example, Tzitzis and food can be discarded, but not degraded. Remember when you had the graciousness to publish In Defense of My Opponents? Now you are lining animal cages with your opponents. You have really slipped. I once was astonished to see in one of these tzedakah ads mailed to me that among the various signatures of rabbanim was - I kid you not- a rebbe's name "signed" with ZTVK"L (in Hebrew) after it! I assumed the person faking the signature reflexively added that after the name. It was truly amazing to see. Ari - As I understand it, it's not like tzitzis etc. Acc. to RSZA, such printed materials never attain any status in the first place. I have to repeat that I am completely taken aback by some of the responses here. It would never, ever occur to me, or to any other pet-owner, not to use newspapers to line cages. And I had absolutely no intention of disrespecting or even criticizing Rav Ovadiah here - the post was about the tzedakah organization that misuses him, not about him. Lining bat cages with the Yated? Should such behavior go on? No! Yes, we get that pet owners use newspapers for lining cages. The problem here is that you are writing about how "valuable" this newspaper is because you can use it for lining cages. You are saying in a demeaning and immature way that the paper is garbage and worthless. Using the paper this way is a derech bizayon, and whether or not it's technically halachically permissible, it's disrespectful to write about how you are using it for this purpose. Stick to the issues and debate your opponents. Use the Yated for what you want, but keep your tone and your writing respectful. Gloves off! "To the batcage!" implies that this material is best suited for bats to deficate and urinate on. Now let me explain the problem. There is the GOOD, the BAD and the UGLY. The GOOD. Shimon Peres is the president of Israel. Would you put a newspaper with his picture in the batcage? I wouldn't because he is the president and should be honored on account of his position. His honor is our very own. What about New Testament or Koran? No, because they are a path to G-d for billions of people and contain a fair amount of Divine truth. R. Ovadiah's honor is the honor of Torah and by extension the honor of the Almighty himself. Es Hashem Elokecha tiro - comes to include talmidei chachomim. It isn't important what the halocha says in this case. It goes to the very core of Torah and spirituality. Also, I don't believe that any posek would allow to line a batcage with a picture of a talmid chochom. The BAD. A person findes a technical heter and quitely lines the his cage with newspapers. He has no chelek leolam habo. Why? The same reason as malbin pnei chavero berabim: his actions indicate that he is on such a madregah that he simply doesn't have the understanding of the Divine to earn a portion in the word to come. The UGLY. A person writes a post 'To the Batcage!' and displays a photograph of R.Ovadiah writing a check to charity. He says to the whole world (it's a blog) this belongs in the batcage! Shocking! deathly offended by the lining of the bird cage: STOP WHINING AND STOP READING !!!!!!! Coincedentally, for the next three Tuesdays the New York City Audubon is hosting twilight walks in Central Park to view bats. It's a really cool thing to try. Sometimes they bring a device so you can hear the bats ultra high frequency noises they make to navigate and find insects to eat. Carol, you're unbelievable. In the past, you have referred to the Rishon Rabbeinu Ephraim ben Shimshon as "kvetching nonsense" and "not being worthy of respect." You claimed that it was perfectly justifiable, if not tactically wise, to assassinate Rabin. And many other extreme comments that I don't recall right now. 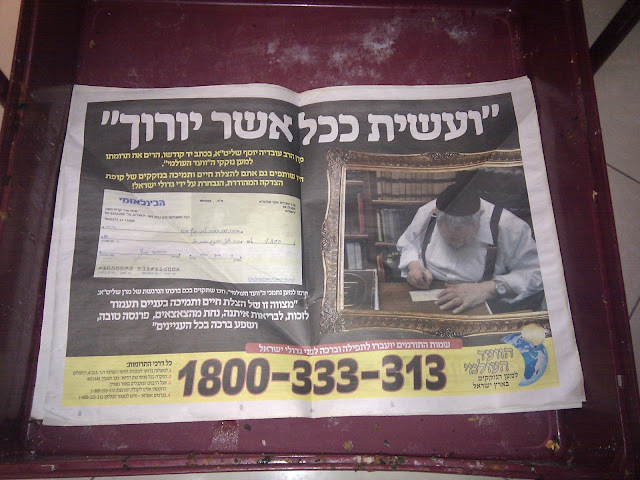 But to line a batcage with a newspaper that has a picture of Rav Ovadiah, you're shocked?! Why? Most posters agree with me. I'm simply an unorthodox orthodox Jew and my views are largely my own. I wouldn't line a batcage with photos of any of these people. Yes, to be mechadesh that Binyomin turned into a wolf is rediculous. I wouldn't disrespect Rabbin on account of his position as a prime minister. However, he was leading the country down the wrong path without a popular mandate to do so and Yigal Amir was justified in his actions. He'd made a mistake but is a good man and his picture doesn't belong in the batcage either. I don't have a problem with Arafat or Kaddafi finding their way to a batcage. I honestly don't know why people are so shocked by this. RNS has a psak, and he's not doing it purposely in order to denigrate Rav Ovadia's kavod. Read his post without bias getting in the way. To all those complaining over a image of a Rabbi. I say this, GOLDEN CALF!!!!!!!!!!!!! May I suggest that you peruse the essay entitled THE ACHISH MELECH GAT AWARD in my book, FOOD FOR THOUGHT, which deals with the Kupat ha-Ir phenomenon. I'd be more inclined to donate to a charity with a haskama from an accountant than a charity with a haskama from a rabbi. I do not question the necessity of giving charity to the poor. I just would like to know what percentage of my donation gets to the poor. Rabbi Slifkin, I just want to say thanks for making me laugh about the silliness of some of the Charedim. I live in Jerusalem and sometimes it can be a little overwhelming living in the sir lachatz, pressure cooker, that the city is. It's nice to let off some steam and instead of exposing the harsh hypocrasy and abuses just go straight for the riduculous. Perhaps the outrage should be directed at the newspaper - given that it will be used as newspaper is, to line batcages, wrap fish, and clean windows - that they nevertheless chose to publish pictures of a Talmid Chacham like R' Ovadiah. The thing is, it's a business. Publishing. Raising funds. Whatever works, and people are not sensitive to the damage they cause. This morning I was at a store, and the proprietor got upset at an ad by a rabbi offering to daven for you at Amuka. Yes, he's making a living and all, but he's causing Chillul Hashem. "I love getting the free weekly Yated Ne'eman and the other Israeli Charedi weeklies. They are so valuable! They are the absolute perfect size for lining the cage of my fruit bats. Bats are extremely messy animals, so I need a lot of these newspapers." "I own bats which are extremely messy animals. This means, I need lots and lots of newspapers to line their cages. Fortunately for me, the weekly Yated Ne'eman and other Israeli Charedi weeklies that I don't read, are sent to me for free on a regular basis so I don't need to go out and purchase special lining for these cages. And the really extra nice part, is that these papers are the perfect size of my cages!" The content is exactly the same, but the tone is very different. In your paragraph, the perfect use of a Yated newspaper is to have Guano placed on it. In the second paragraph, you get benefit from free papers that get sent to your door, which you don't read but rather use for cage lining. Carol, you gave as an example of GOOD as lining the cage with a picture of Shimon Peres, Did you choose him intentionally? remember 3 months ago RNS wrote a post about his visit to Peres and praised him to high heavens, where as a few days before he had a mouthful to say on R Eliashiv. Doesn't והיו עיניך רואות את מוריך also count for rodents? Joke aside, puhleeze guys, you are almost starting to sound like muslims wailing about the mistreatment of their Qur'an. We are talking about pictures in newspapers here, not about sheimos. RNS: as you know, just because something is permissible, it doesn't mean its right, or good or encouraged. You quote RSZA - do you think he'd encourage your use of the photos? I see the problem like this. Back in the day the prophets used to exhort the masses to follow in the ways of G-d. Today the masses are exhorted to follow in the ways of the rabbis. A nuanced differance but it says it all. Carol, you gave as an example of GOOD as lining the cage with a picture of Shimon Peres, Did you choose him intentionally? Yes, but I hope it's clear that I'm against dising the president. I chose him because of the prior posts and because I personaly dislike him. It's like in that joke where they asked a man if he ever thought of divorcing his wife. So he replied: 'Murder - yes, divorce - no'. Rabbi Slifkin can you give your readers an example of what you believe is considered being mevazea a Talmid Chochom on which the Rambam has not very nice things to say... If calling R Matisyahu's views pathetic, and allowing your bat to relieve iself over R Ovadia what in your eyes constitutes being mevaze Talmid Chochom? 4. deliberately editing and distorting another rabbi's words so as to bring them in line with one's own hashkafos. The issue is not that you use the Yated to line bird cages(which is fine) it's that you choose to publicize it, in the manner in which you did. A lot of things people do, even if many people do it, should not be discussed publicly. Of course the Yated itself has no such scruples;certainly Kupat Hair flyers should be treated as garbage; for sure most of your readers dont practice GEDOILIM worship; certainly its wrong that Charedim dont give respect to others as they think themselves entitled to. But like someone said above, the question is if you want to get down in the gutter with them or not. Taht's the Q.
I definitely do not agree with you. Murdering Rabin was lunacy , and could endanger the rule of law in any country. It`s covered in Perek,` Ilmaleh hora`ah`. And that refers to non-Jewish rulers. This stuff here I take lightly, as you can tell from my earlier posts. Once people start putting each other in cherem,calling each other kefirim,then the debate descdends into mud-slinging. I heard many years ago from Machon Shilo's Rav David Bar-Hayim the same regarding the lack of obligation to follow the gedolim. Indeed, this is the opinion of the Sefer HaHinuch but not of the vast majority of the Rishonim. You're absolutely correct regarding the outrageous actions of Rabin and Yigal Amir's actions in defense of am yisrael. "The newspaper today is problematic and it simply worthless. Once upon a time there was one newspaper, Hamodia. It was good for many things, to clean windows, sift flour, wrap fish and do many things with it. Today B”H there are a few, each with a purpose. HaMevaser today is still good to clean windows. Mishpacha is good for wrapping fish since it is a better quality paper. Yated Ne’eman is good for nothing." R. Slifkin's post looks positively mild by comparison! I liked the post, though I agree with the commenters who are upset (or perhaps just weirded out) by bats pooping on R' Ovadia. I would suggest that the next time you open your cage liner and discover a picture of a talmid chacham, that you should turn the page before letting your bats have at it. This post is clearly hostile. RNS is engaging in a midah keneged midah. The Gedolim metaphorically defecated over RNS's zoological work and he is letting his zoological specimens defecate over a metaphorical representation of the gedolim. Brownie, that`s not true at all. You can sprinkle water on it and use it to keep your hoshanos nice and moist during Sukot. I`ll keep an eye out , see if I can spot some squeegee kid using any if these papers on the job. This is somewhat off-topic, but I understand that Yated has "improved", in that R. Steinman has instructed the paper to not be antagonistic towards other groups (Chabad, Sephardim, etc.). In my own selective reading, the editorials are certainly more mellow now than what they were printing before the passing of the Lubavitcher Rebbe, o.b.m. I'm a little taken aback by those who think Yated was better when it was more in "attack" mode. Even though acc. to halacha you are correct. I would like to know if you would the same with a newspaper picture of your rebbi or someone who you respect? How about the Baba Sali? What would a talmid chacham say? Finally an appropriate use for Yated Ne'eman, at least it does not become a complete waste. I.e. it is good for something. As for all those complaints about the use of a paper of an advertisement that depicts an abuse of both rabbinic authority, and that of fundraising for charity for lining the bat cage with. I don't know who that man in the picture is, but if he is a willing participant in this scheme, I do not see where the talmid chacham is, and if he is not a willing participant ( if he is a real talmid chacham ) then he would be thankful for this paper not being completely wasted, and not to mention how a shamed he must feel to have his image involved with such a dishonorable disgracefulness of an advertisement. But on a lighter note, if it is so important for all you complainers to show how holy you are, why has not anyone said anything about the poor bats that have to live with these papers constantly in their cage? It may be tantamount to Tza'ar Baalei Chaim. When your post causes commenters to arbitrarily strip people of olam haba and make up new criteria for Judaism, you have already won. I am in favor of critiquing harediism but am opposed to unnecessary or distasteful attacks upon talmidei hachamim of any hashqafah. Please remove this offensive picture which exudes disrespect towards a Torah scholar. Would you have posted such a picture featuring Rav Aharon Lichtenstein, Rav Herschel Schachter, or Rav David Bar-Hayim? Yosef: Who are you to tell Rabbi Slifkin what to do? I am confused, your link to R Ovadias condemnation of your work says clearly he was told by English speaking Talmidei Chachamim yirei shomayim what your books contain. If the torah allows us to kill someone relying on 2 witnesses surely one can ban a book on their testimony.....? I understand how difficult that period must have been for you, however we who are influenced by the secular world will obviously deem it strange how a book can be banned without even reading it, however our Gedolim who live with the Torah which says one can rely on 2 witnesses obviously trust them as if they would have read it themselves. Eli, go learn some more. About the halachos of testimony, and about Rambam's view of creation. Remember when you had the graciousness to publish In Defense Of My Opponents? Now you line your opponents in animal cages. Quite a slip. PET OWNERS USE NEWSPAPERS TO LINE BIRDCAGES. They don't check what's in them. Ben Dov, I checked your commenting history. Amongst numerous objections to my writings, you objected to my showing a picture of Wormtongue's manipulation of Theoden when discussing Tropper's manipulation of Gedolim! In my view, your sensitivities are rather strange. Rabbi, due to the fact that overwhelming majority of comments here indicate that people view your practice in this instance to be, let's say, not in good taste, I'm curious if you will rethink your position and change your practice. Especially for such a trite issue. And if not, what would it take to make you reconsider? There, now it says Bat 41 times in these comments. I don't know why there's such a big controversy about batting cages. Though I would add that those who attacked your books never used them for their bat poop.
" do not attain the status of sanctity as long as they are not read by people." who reads them then, chiroptera's? Im guessing you mean writen. Either way does this apply to printed Torah's and NaKh's ? In the same light is could this be related to RaMBaM's comment on how a talith should not have writing on it ? "And therefore it is permitted to go into a toilet wearing a fringed tallit--both when one's nakedness is hidden and when it is not--and to tread upon it with the foot and to make use of it--for example, spreading it out and using it to cover things--all this is permitted. And how can we expose verses from the Torah which were written in sanctity from the mouth of the Almighty to such degradation?" (Responsa of the Rambam, 268). Tropper is not relevant to my post, but since you brought it up, i thought you were mocking the Rabbi next to Tropper, not Tropper himself. Do you want to get back on topic? I was only slightly disturbed by the newspaper in the batcage. (It probably wouldn't have bothered me at all if an Ashkenazi rabbi were getting the bat treatment instead of Hacham Ovadia.) But I did find the tone of the post a bit off from your usual style, and thought maybe you were getting too Israeli for your American audience. Since it has offended so many, in ways that are so difficult to explain, perhaps it would be better to restate the post in a way that is less offensive to non-pet owners. I wouldn't want your point to get lost among irreconcilable cultural differences. The bats are not relieving themselves on R' Ovadiah, but on a newspaper picture of him. Not being able to distinguish between the two gives me an insight into how some people can worship idols. Started reading, and got to this statement: "Fundraising for (alleged) charitable causes is also abused in the charedi world. The charedi world does excel at giving charity". There are abuses in ALL segments of society, so why slander "the chareidi world"? Jews are extremely variegate, whatever their backgrounds, so why with one fell swoop cast aspersion on so great a cross-section of world Jewry? Because it's davka in charedi society where such abuse is done openly, in the press, with no shame.